The Spoked Traveller | Am I home, yet? 29 Sep Am I home, yet? I moved to Toronto from London, Ontario last February. After a few decades in London–thank goodness for travelling every summer–I needed a change. And, I think I have begun to carve out a little niche in T-dot. Even though I drive back and forth to teach at Western University, my cousin (and roommate) and I have our traditions. One is a family taco night on Sundays–if we’re both around. Jodie also loves the patio at a bar called Ronnie’s in Kensington Market. It’s a slice of eccentrics and artsies and cool people. It is the ultimate people-watching place. 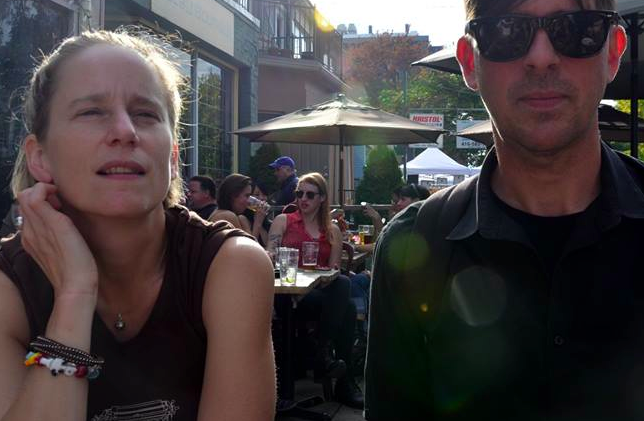 Here is a recent photo of Jodie and I on a Sunday afternoon when Kensington has shut down car traffic; sitting on the patio, in this weather that makes you long for a beach and a cold mohito, we’re just two chums soaking it all up.